There was no hurrying to the various mountain destinations we planned to visit. 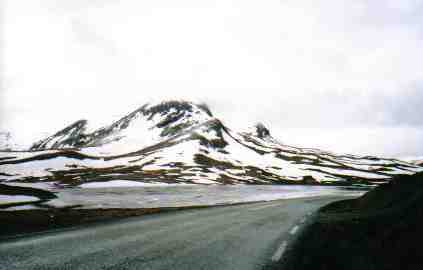 The sinuous fjord-side roads were frequently interrupted by expanses of water, with most journeys requiring a ferry crossing. Even at greater than 60° N, the sun was only just about persuaded to set in June. It was way past midnight, but light still permeated the room. The gauze-thin curtains offered no resistance to its passage and even the thick towels festooned over them had not improved the situation. Strange though it may seem, I prefer to sleep in the dark. Sighing, I threw off the covers and left the bedroom. In the lounge of the wooden cabin, the full front window looked down over the expanse of the Norwegian Sognefjord. 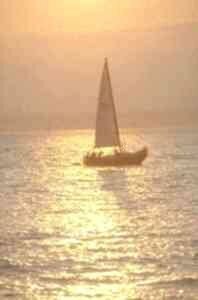 The waters rippled with a stainless steel sheen. By 8am this would become glittering silver, whilst the mid-afternoon sun burnt the water gold against the backdrop of grey-green hills. We were staying right on the north bank of the deep 200km long fjord that cuts in from the Atlantic north of Bergen. Our secluded accommodation, booked from the UK, was five minutes walk along grassy woodland rides from Balestrand, inhabited by about 2,000 people. Although other tourists were in evidence, it was hardly overrun. Visitors came to see the stave church in the village, although it was not authentically Norwegian. A British lady living in Norway was responsible for it, but elsewhere in Norway more than 25 of these timber churches remain, some from the 12th century. From Balestrand, there was no hurrying to the various mountain destinations we planned to visit. 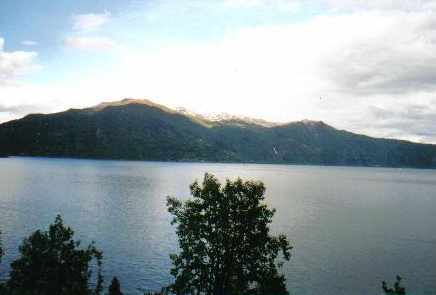 The sinuous fjord-side roads were frequently interrupted by expanses of water, with most journeys requiring a ferry crossing. These were run with typical Scandinavian efficiency, and we soon got the hang of timing our arrival on the quay perfectly, albeit with some rather adventurous driving at times! And woe-betide anyone without the correct money, if they encountered the ferryman (who had a passing resemblance to Captain Bird's-Eye on the Hella-Dragsvik route)! The other certainty about road travel in Norway was tunnels. And we’re not talking little ones here. The longest was over 24 kilometres in length, between Fodnes and Aurland, and this incorporated blue lighting at frequent intervals to give the impression of being inside a glacier. Having never been inside a glacier, and most certainly not through one at 60km per hour, it was a little hard to judge the authenticity. This tunnel took us on toward Flåm and one of the steepest railways in the world. 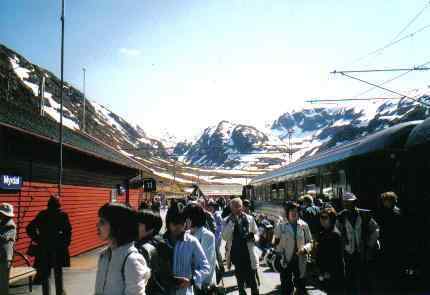 In 50 minutes the train climbed a precipitous 863 metres up to Myrdal taking in some sweeping mountain vistas. Half way up the train stopped where the mighty Kjifossen Waterfall thundered under the bridge crossed by the tracks. Everyone piled out onto the balcony whereupon a woman dressed as a fairy queen emerged from behind a rock higher on the slope. Apparently she was there to 'lure unwary travellers away', but my attention had been drawn to a rather more naturally plumaged ring ouzel thrush alighting on a nearby boulder. All of our excursions from Balestrand took us high into the mountain scenery, where we even experienced a snowstorm over a frozen lake – in mid-June. Lunar landscapes framed plunging falls, and it soon became apparent that my leisure footwear, worn marble smooth on the soles, were really not sufficient for serious exploration. When not sinking into the numerous bogs I was failing to grip boulders scoured smooth by glacial action. 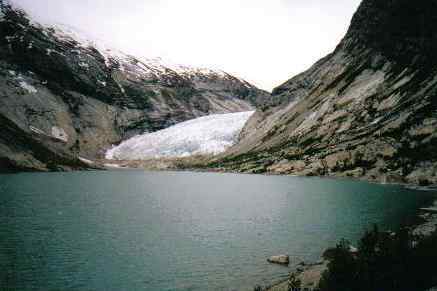 The latter situation occurred at the Nigardsbreen glacier, an arm of the mighty Jostedalsbreen that has been in full retreat for a number of years. We were able to walk through lakeside birch woods where metres of ice had been 20 years earlier. With proper walking boots, we could have made it to the base of the hulking ice-monster itself. The most impressive snow was on the high tops on the Gaupne road. Here the pristine drifts reached waist height among the snow poles. Back down the road, we stopped for a cup of tea at the Turtagrø Hotel. Unfortunately, at the time there was not much of the hotel left to run, since it had burnt down in January 2001, but there were plans to redevelop it, which have now been realised. Our introduction to Norway’s mountains had come on the six-and-a-half hour train trip from Oslo to Bergen. From sea level at both ends, the track traversed the roof of Norway, passing from balmy sea breezes to snow covered peaks under leaden skies. It is rated as one of the great train journeys of the world, and the sheer scenic variability justified that claim. Bergen is famous for rain, and yes, it did. On arrival, we wheeled our suitcases through a deluge, finally locating our hotel with some relief. Having booked over the Internet some months earlier, no problems were anticipated. However, the sheepish grin on the proprietor’s face suggested something was amiss. Someone (not him personally of course) had made a mistake – the room was double-booked. Bergen was bustling at this time, and the chances of finding another hotel at 8pm were not good. In many other parts of the world panic would have set in, but this being efficient Scandinavia, when he said that his brother had a 'flat he was doing up,' we were inclined to go along with him. Indeed, apart from some serious construction work on the stairs leading up to it, the apartment was spotless. Bergen did warm up, from frigid to merely cool, and in the brief time we were there we enjoyed the sights on offer, especially around the Bryggen quarter (see [www.bergen-guide.com] for Bergen information). The Hanseatisk museum depicted Bergen life in times gone by, and the aquarium housed a wide range of sea-life. Our Norway adventure had begun back in Oslo, and we returned there at the end. The cosmopolitan city was blessed with a wealth of parks and museums, the highlight for me being the exhibitions of Edvard Munch. His most famous painting was of course 'The Scream', depicting a skeletal figure, hands clapped to ears, mouth open in a wide 'O'. We were lucky enough to see it before it was stolen. Studying it closely I noted that behind the tortured figure the sun flares an angry blood-red. At 3am in the Sognefjord cabin, I knew exactly how he felt! If you enjoyed reading the above article then you will probably also enjoy Altai Republic in Russia by Graeme Down, and Cannes, also in Europe, and our latest articles covering the Orinoco Delta, La Mata, Marbella and Beijing. Who are you? What have we done to each other? These are the questions Nick Dunne finds himself asking on the morning of his 5th wedding anniversary when his wife Amy disappears. The police suspect Nick. Even his sister is unsure. Under mounting pressure from the police and the media�as well as Amy�s fiercely doting parents�the town golden boy parades an endless series of lies, deceits, and inappropriate behavior.